What made you apply to our Internship programme? Hannah: After completing an earlier work experience programme in marketing, I became really interested in the field and wanted to learn more. I found Paperclip and was really interested in the company. I saw that they were looking for a marketing intern so I applied straightaway! Jess: My degree requires me to complete a work-based placement and I wanted to gain more experience as I really want to work in marketing after finishing university. What have you been doing prior to your placement? Hannah: I ’m currently a final year student at Cardiff University studying English Literature. I’ve always loved literature and reading between the lines so this course was perfect for me and has set me up with some great skills that I can take with me for future jobs. Jess: I am currently studying Journalism at the University of South Wales The course has given me a broad insight into the media industry and has set me with many skills. My journey into discovering marketing was when I applied for Cardiff TV, expecting to create hard news stories, instead I was given a lot more promotional work. I was covering events happening in Cardiff from Charities to entertainment and I thoroughly enjoyed promoting organisations and people’s message. What do you want to achieve here at Paperclip? Jess: In the future I hope to travel to a few more places and bag myself a full-time job in marketing. I think Paperclip is a great stepping stone for me to gain the appropriate skills ready for the marketing world. Hannah: I’m hoping to pursue a career in marketing and communications, so my internship here at Paperclip is providing me with the necessary experience to be able to achieve this in the future. Jess: In my free time I sometimes draw and paint and I love to plan holidays and write for my blog. I train a lot in the gym and train children in cheerleading. I’m on my way to becoming a Level 1 Cheer Coach. Hannah: I like to curl up with a glass of wine and a good book. I also like to watch true crime and nature documentaries, so Netflix is my best friend! Want to keep up to date with latest news from Paperclip HQ? Follow us on Facebook. Lorenzo: I study Translation with minor studies in International Marketing at my university in Italy. The reason why I chose this university is that I have always been passionate about languages, communication and travelling. I have also lived in Denmark as an exchange student for a year, and that helped me realize that I wanted to get more international experiences, so here I am! Tara: I studied advertising design at USW. I was a strategic planning executive at a media agency previously in Bristol. I have had internships in account handling and planning too. Lorenzo: Every student in my university has to do an internship before graduating, and it can be done locally or abroad. I’ve always been quite open-minded, so I wanted to challenge myself and try and get a real internship that would really help me improve my skills while working on something cool. Looking around erasmusintern.org I found Paperclip and I applied. It was exactly what I was looking for! What do you want to achieve during your time with Paperclip? Tara: I want to combine my love for creative projects with my interest in marketing and work closely with a small team dynamic and see the company achieve its targets and continue to grow. Lorenzo: My goal in life is to get enough experience to create my own company. Ideally, I would like to live in Italy, but who knows? And what do you get up to in your spare time? Tara: I play hockey three times a week and enjoy going to the gym, but in contrast I also enjoy eating/drinking cocktails out a lot too. Lorenzo: Reading is something that takes a lot of my time: I enjoy books related to marketing and startups, but also fiction. Other than that, I like walking and hanging out with friends: I am a very chatty person, I very much enjoy being surrounded with people and talk about many different topics. It's great to have you on our team! Good luck in your new roles. Make sure you follow us on Twitter to keep updated on the latest updates from Paperclip HQ. It's been a busy start to the year at Paperclip HQ. Not only have we launched two more university marketplaces (details to follow), but we have also partnered with the Keele University Entrepreneurial Society to promote their campus marketplace. The new partnership allows members of the society to gain valuable work experience through Paperclip, either working as part of the Student Brand Ambassador team or Student Researchers, with the aim of growing the marketplace’s userbase and generating feedback from our existing users. Since the Keele student marketplace launched in September 2018, over 1,200 students (12% of the student population) have already signed up. 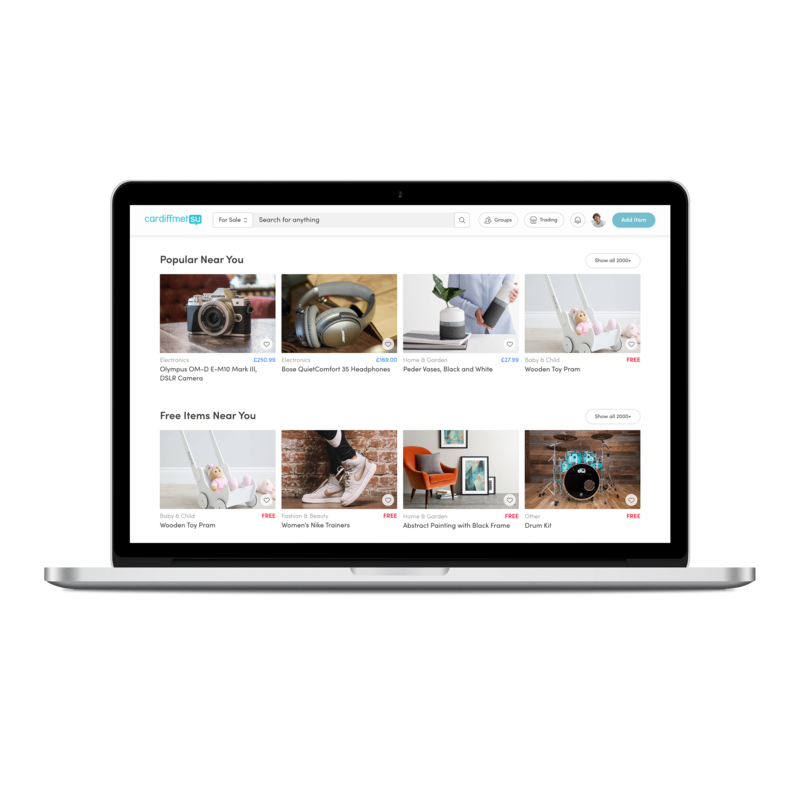 Users have access to the hundreds of items on the marketplace along with some exclusive students deals. Alongside the work experience opportunities for students of Keele’s Entrepreneurial Society, Paperclip are also sponsoring the society's on-campus events. Yesterday, the team helped arrange a guest lecture from entrepreneur and BBC's The Apprentice finalist Kayode Damali. Needless to say, the event was a sell-out and the team were delighted to help inspire the next generation of entrepreneurs. Speaking about the new partnership, society President Lucy Whitehouse said "The Keele Entrepreneurship Society is a student led society that aims to aid and nurture young entrepreneurs. The society provides weekly workshops that focus on elements of entrepreneurship such as accounting, marketing and Companies House admin. All of our members have access to one to one sessions to work on their business plans and work skills. The Entrepreneurship society partnered with Paperclip, as they offered opportunities that would develop our members’ skill set and enhance their CVs. Paperclip has sponsored events and given our members the opportunity to gain valuable work experience and also paid part time work - both of which will help our members in the future!" Speaking after the event, Paperclip CMO Laurence added, "It was a pleasure to meet our new Ent' Soc' Brand Ambassador team and to chat to Kayode. The feedback from the event has been great and we really look forward to supporting the society and the great work they do throughout the year." Would you university benefit from a campus marketplace? Get in touch here. Welcome to the first update of 2019! 2018 was a busy year for Paperclip and we haven't slowed down since. The team at HQ have been busy building new marketplaces for our university and corporate clients as well as adding new exclusive offers and discounts for student users. This week, the Marketing Team headed to central London for the Queen Mary University of London Refresher's event to promote the QMSU Paperclip marketplace. The Ambassador Team in party mode at Queen Mary! Every year, thousands of students flock to the Queen Mary Students Union to join societies, clubs and take advantage of the student deals available through the SU's corporate partners. Over the Christmas break, we have been adding to the Queen Mary Brand Ambassador team, with second year IT student Oghosa and third year Maths students Gurdeep joining the ranks. Oghosa, originally from Essex, said "I am thrilled to be joining the team. 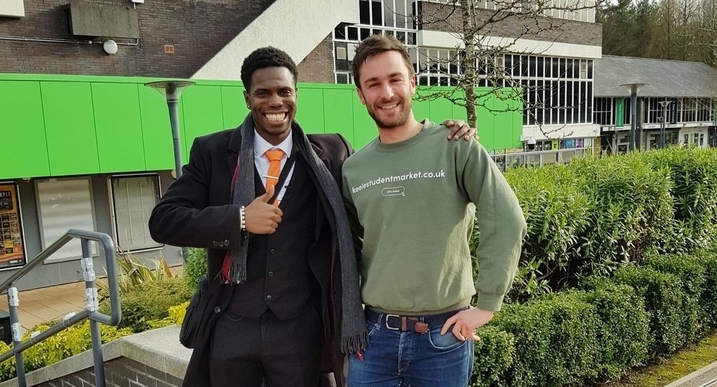 I had heard about the marketplace from some of my friends around campus and when I learned that I could make some extra cash from promoting the marketplace around uni, I was keen to get involved." Speaking after the event, Paperclip Marketing Manager Justin said "It was a great event and we are pleased to be adding another 200 plus new users to the Queen Mary SU marketplace. Though today was really busy, it proved a good opportunity to connect with the students we didn't get to speak to during Fresher's week and those enrolling in January." What's next for Team Paperclip? Over the coming weeks, the Paperclip team will be attending similar events to promote our student marketplaces at Keele University, Imperial College London, University of Southampton and more. We will also be attending Refresher's events at two new brand new client universities at different ends of the country. Check out next week's blog to find out which universities have joined the Paperclip family. Could your university benefit from a bespoke student marketplace? Get in touch here. Last week, we gleefully announced that Paperclip will be powering the official marketplace for Brunel students. This time, the team are heading just five minutes from Paperclip HQ to Cardiff Metropolitan University. Cardiff Metropolitan is one of the country's fastest growing unis and houses the famous Cardiff School of Art & Design. The university has over 13,000 students studying across their campuses in Llandaff and Cyncoed. Paperclip CMO Laurence comments "We are delighted to have Cardiff Metropolitan University on board. The university has a great reputation at home and abroad and we are excited to be launching the marketplace alongside The Union. As an (adopted) Cardiffian, it's great to be working with a student community so close to home. Here our knowledge of the area will prove invaluable as we aim to reach out to students through local events, partnerships with popular local brands and engaging with students face-to-face." The Cardiff Met marketplace has been prepped and will be launched this month, in time for the new 2018/19 cohort. We managed to speak with David Jackson Commercial Development Manager at Cardiff Met Students' Union who added "For most students, going to university is their first time leaving home which means they need all the university essentials. With a degree costing so much, they need to find ways to keep their living costs down. This is where the marketplace comes in." Our new Marketing Officer Justin, who will be spearheading the student onboarding process at this uni, said "It's great to be working with Cardiff Met Student Union. With our ability to dedicate more time to student engagement, we can gather valuable feedback through focus groups which will allow us to further grow our platform." Could your university benefit from a student marketplace? Get in touch!